Finally Rangpur Riders has qualified for the final where they will face Dhaka Dynamites. It is the fifth season of Bangladesh Premier League or BPL but Rangpur Riders did not take part since the beginning. So, it is their 4th season of BPL and they yet to win any title of it. Rangpur Riders finished their last season by standing 5th position on the point table and so, it is their first time where they have made it to final. In 2nd qualifier match, Rangpur Riders beat Comilla by 36 runs which was so dramatic. The match was hosted at Sher-e-Bangla National Cricket Stadium, Dhaka in 10th December, 2017 but after finishing the seven overs successfully rain stopped the play and so time was runout. Due to that the match between them was hosted in reserve day which was 11th December, 2017. Rangpur Riders scored 192 runs by batting first time in exchange for just three wickets. In return, Comilla Victorians lost their all wickets in 156 runs though they played whole 20 overs. For Rangpur Riders Johnson Charles made an amazing century and another hard hitter McCullum scored significant runs so far. On the other hand, for Comilla Victorians Liton Das scored 39 runs. So, Rangpur Riders moved to the final and Comilla Victorians were ruled out from the competition. Earlier, Comilla Victorians won the toss and came to bowl first. Charles and Chris Gayle opened the innings for Riders where Gayle was hit by the bowl and got out so early. He scored just 3 runs by facing 10 balls. Later, McCullum came and joined with Charles. Both added more than 150 runs to the score board. 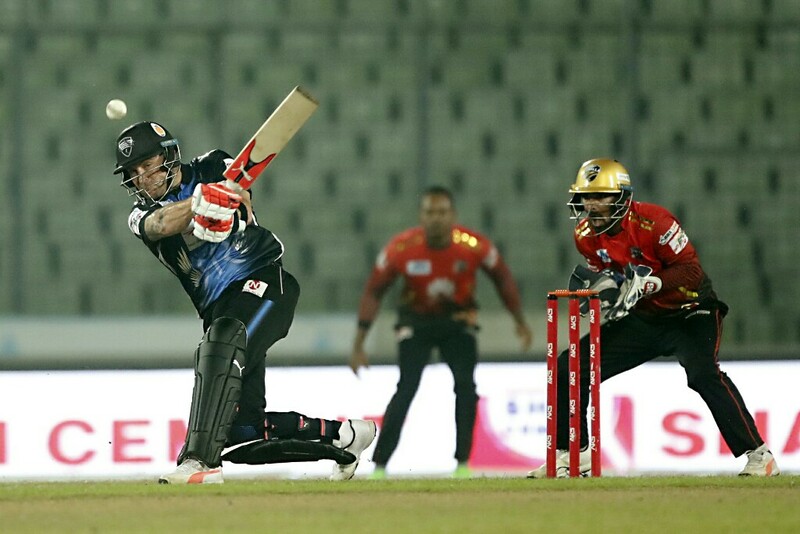 McCullum got out with his individual 78 runs. He played well in that day and made nine 6’s in his innings. Later, Bopara came but could not make stand. He tried to make big shot but gave catch at the boundary. Mashrafe also came but did not have to bat but Charles finished the innings. Finally in 20 overs Rangpur Riders scored 192 runs losing three wickets so far. Hasan Ali, Mehedi Hasan and Saifuddin took one wicket each. On the other side, Tamim and Liton made a good start for Comilla. Their partnership added 54 runs when Tamim was gone with his 36 runs. He played just 19 balls where he made six 4’s and one 6. Later Imrul Kayes came but faced just 2 balls and got out. Shoaib Malik, Marlon Samuels and Buttler also played and tried a bit but they did not cross 30 runs milestone out there. So, Thei innings finished with 156 runs. Rubel Hossain took highest three wickets for Riders.